Is your back in pain all the time? Does it affect your life and how active you are? You are not alone – millions of Americans are afflicted with persistent back pain, and it is the primary reason for disability among individuals under 45 years of age1. The typical response for people with chronic back pain is to become less active, but this can make the pain worse. People with chronic back pain often decrease their activity level to prevent further damage, and some may stop working altogether. Cutting back on physical activities that you once enjoyed can dampen your spirit and quality of life, and this may postpone your recovery1. Friends, family members, and employers can also slow your recovery by being too helpful instead of making you more active, which could aid in your recovery. If you think you have chronic back pain, read on, and learn the signs and symptoms of persistent back pain, the causes for this type of back pain, and some tips on controlling persistent back pain. Pain from spine problems – Pain in your back can be caused by problems in the muscles, discs, and joints of your spine. For example, a herniated disc results from wear and tear and happens when the soft tissue in your discs has come out. A degenerative disc occurs when the discs between the vertebrae of your spine wear out and your bones rub together. If you have spinal stenosis, the size of your spinal canal has decreased, which puts pressure on your nerves and makes you feel numb. Pain from injuries and accidents – Persistent back pain often happens after auto accidents, sports injuries, falls, fractures, and strains. A hit to your back can break your spine and lead to chronic back pain. Lifting something too heavy or twisting your back in an awkward position can cause back pain. Playing sports like football or rugby and weightlifting can lead to strained and torn muscles and tendons in your back. Lifestyle causes – Bad habits frequently result in chronic back pain. These include bad posture, slouching when sitting down, smoking, lifting objects that are too heavy, using your lower back too much, lack of exercise, smoking, and wearing heels that are too high. Emotional and mental causes – Your emotional and mental condition can affect your physical condition. Having too much stress in your life, feeling depressed and anxious, and working too much can lead to excess tension in your back. Medical conditions – Conditions like arthritis, spine curvature, cancer, and pregnancy cause inflammation, stiffness, cartilage breakdown, and excess weight, which lead to chronic back pain. Exercise – Begin with simple stretching and cardiovascular exercises like walking, and slowly build up to more advanced strengthening exercises like weightlifting. Resolve conflicts – Resolve any family or social conflicts as these can increase your stress level and delay your recovery. Continue working – Stay working, because studies have shown that work gives you a purpose in life and reduces your focus on your back pain. Avoid relying on medicine – Taking medicine for pain relief can be helpful in getting you to move, but it can make recovery harder as you might begin to rely too much on medication and less on becoming more active to reduce the pain. Rest and relax – Be sure to take frequent breaks during your activities, get enough sleep, and relax by doing breathing exercises. Relaxing is important, because it can trigger your body’s natural pain-relieving responses. Work through the pain – Understand that pain flare-ups are likely to happen, but do not let them slow your activity level. Continue to work, play sports, exercise, and do household chores to relieve and recover from your back pain. Everyone is affected by occasional back pain. However, when the pain persists for several months, and you have tried different kinds of treatment to no avail, that is when you should consider focusing on regaining a normal routine and quality of life by becoming more active. 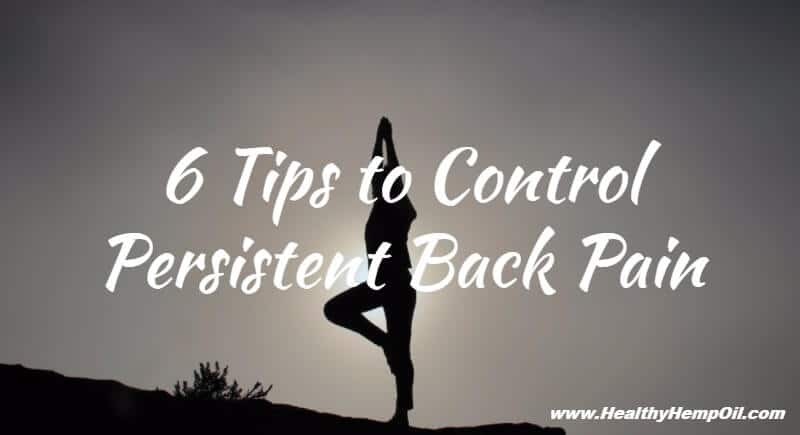 In this article, you learned about the signs and symptoms of persistent back pain, what causes it, and tips on relieving the pain by becoming more active. If you are in this situation, try some of these tips, and see if they help. Have you experienced back pain that did not go away? What did you do to lessen the pain? Let us know in the comments. This entry was posted in CBD Health Benefits and tagged Chronic Pain. Marijuana and Motivation: Fact or Fiction?